The biggest revelation from my experience playing CivFanatics Game of the Month 06 was the usefulness of seaside resorts for a Cultural victory attempt. Some of the other players had used the seaside resorts to rack up extremely early win dates, and I wanted to try another game to get some experience in how they worked. Since I also hadn't played out a cultural game on stream previously, I decided to combine these two goals together and Livestream my efforts as I attempted to build a seaside resort paradise. The resorts are enabled at Radio technology, and provide double their tile appeal in tourism, with a requirement that their tile must be coastal and must have an appeal of "Breathtaking" (4) or higher. 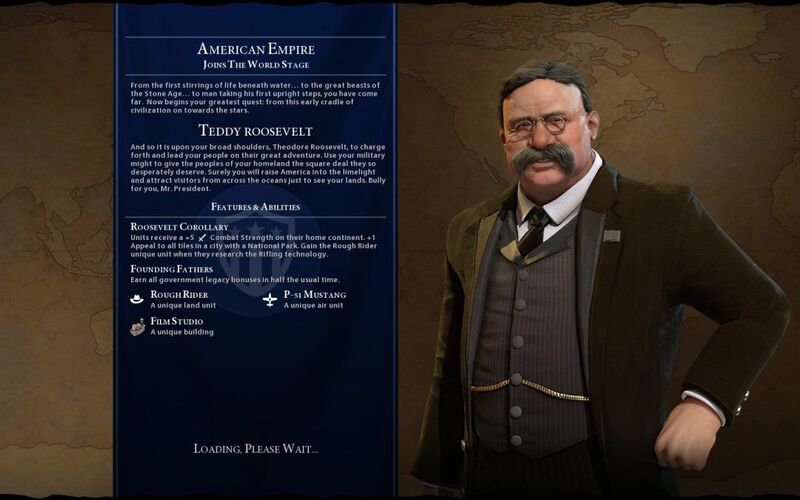 I figured that America would be a good choice for the civilization, fitting the tourist theme of this game and having the lategame Film Studio unique building to increase my tourism output. The Film Studio produces +100% tourism in the city where it's built, which is an odd mechanic that doesn't exist anywhere else in the game. Everything else related to tourism provides a civ-wide modifier, not a city-centric modifier. I would also be playing a variant in this game: all tourism must come from wonders or seaside resorts. No tourism from Great Works or artifacts this time. I wanted to explore the limits of the seaside resorts and see how far they could take me. For the map choice, I decided that I would play an archipelago setup, with a hot climate to ensure lots of eligible spots for resorts. The only archipelago map script in Civ6 seems to be the "Island Plates" setup, which often tends to produce more in the way of snaky continents than genuine islands. Before starting this game, I played around with the map generator a bit, seeing what kind of maps the different options would produce. I found that the "High" sea level tended to produce more in the way of continents, while the "Low" sea level tended towards islands - exactly the opposite of what one would expect. Did someone mess up while doing the programming (?) In any case, this game would use the "Low" sea level setting. Finally, I was looking for a peaceful builder's game here, and as such I decided to turn off the barbarians and reduce the number of competing AI civs down to four. That should give everyone room to spread out in peace, and let me get on with the task of setting up my resorts. With no barbarians for this game, I felt free to open with a scout. I also considered opening builder-first, which I would never do in a game with barbarians turned on, before judging that I did want at least one scout for exploration purposes. Well, that would turn out to be a waste because my starting location ended up being on a relatively small island, and the starting warrior could have defogged everything without a problem. Ah well, no way to know that before playing. Some of the islands ended up being quite large, and a scout would have been very helpful in those locations. The immediate land here at the capital was excellent. This was more like Texas than Washington, with cattle and horses sprinkled liberally around the starting tile. With four pasturable resources immediately available, I knew right away that I wanted God of the Open Sky for my pantheon. Landing +1 culture on pastures would accelerate my early game towards the first governments and some of the key civics. The only downside to this location was a lack of hill tiles for production; there's not a single hill visible in that screenshot. This wouldn't be an issue in the early game, with stone quarries and that very nice fur tile available, however it would limit the longterm usefulness of the capital. This wasn't quite what I had in mind when I envisioned this game! There was room for three decent cities here, with the third one going in the southeast near the furs and copper, and then three more scattered fishing villages of low quality. Six cities was the most that I could get, and that was going to be with very tight spacing, each city at the minimum possible distance of four tiles. 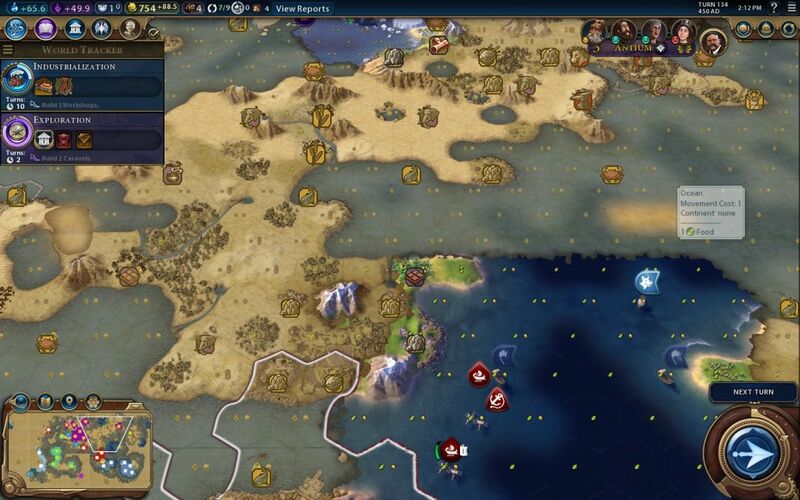 Those fishing villages were going to be some sad spots too; non-resource water tiles in Civ6 have a yield of 1/0/1 and can never be improved further. They are bad tiles and should essentially never be worked by a population point. Ugh. Not looking pretty here. The one saving grace was that New York was another strong city in its own right, with a collection of resources and lots of hill tiles for mining. All of the hills on this island seemed to be located over on the east side for whatever reason. 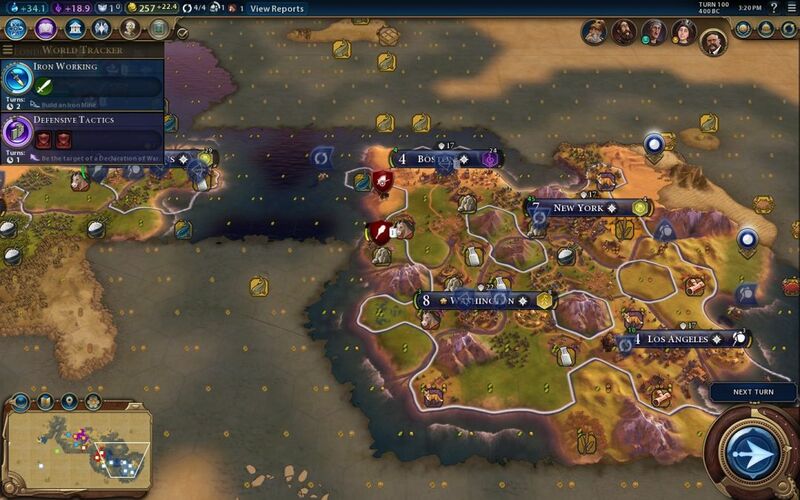 I decided that my general gameplan would be to fill up my starting island with cities and then look to explore overseas. Turtling here on a half dozen cities wasn't going to be enough to win the game. Here's what things looked like just after Turn 50. I was doing the normal development thing at the start and didn't have much to comment on out of the ordinary. Los Angeles would prove to be the last strong city on my initial island, with excellent production at the cost of relatively little food. Here on this archipelago setup, there wasn't much room to set up farms like I would on a normal map. Too many resources that I didn't want to (or couldn't) remove, too many desert tiles that couldn't be farmed at all. Note that I have used my accumulated gold for a cash-rushed galley in Los Angeles. I needed map information in the worst way, as that would allow me to see where I should be pushing future settlers. Washington and New York were both off the coast, and therefore couldn't build any naval units until they constructed harbors. It was going to have to be Los Angeles, and cash-rushing the galley was by far the fastest way to get one out on the map and exploring. What the... Now I get the logic behind improving the two resources over on that other island, and with all land units able to embark under the One Unit Per Tile ruleset, it's not particularly hard for the builder to get over there. But you can't tell me that this screenshot doesn't look pretty weird. New Orleans was located near the mouth of that little river, with two more cattle and an additional horse resource. My pantheon made that land even better than normal, and it was a very hot commodity for my civ indeed. I wondered why England had made no attempt to settle here; with luck, I would grab the fertile south and that desert region in the middle of the island could serve as a kind of buffer zone between us. Note as well that I have two galleys on the map, with the second one also cash-rushed out of Los Angeles. The goal was to pick up the boost for Shipbuilding tech, which comes from building two galleys, but the ships themselves were also quite useful as explorers. 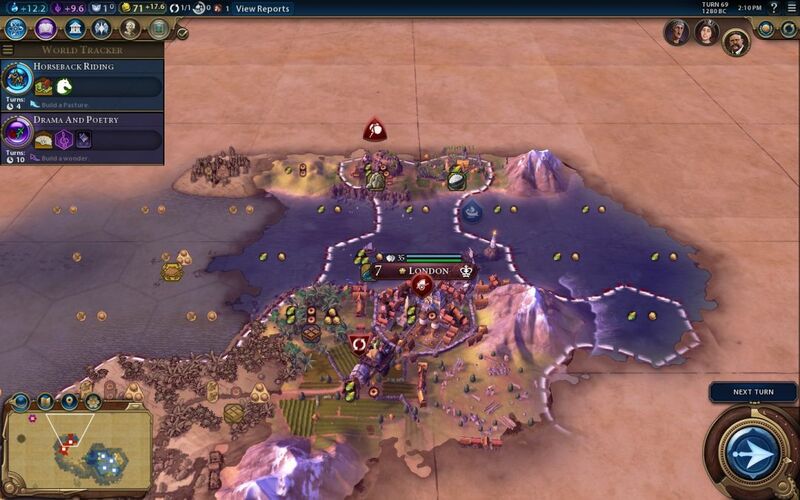 This was the first time that I'd played a game on an archipelago setup in Civ6, and the tech emphasis is a bit different. Shipbuilding (for embarking units) and Cartography (for ocean travel) both become a lot higher on the priority list, as well as anything that boosts movement speed at sea. In most games, that stuff is completely forgettable. Not so much here though. Uh oh. In chillingly efficient fashion, Victoria surrounded the city with her units and moved in for the kill. They captured New Orleans on the interturn and my archer never even managed to get a shot off. Geeze, what the heck Victoria? Where was this from the AI in the other games that I've been playing?! This attack was shockingly well done, isolating a target and ruthlessly taking the objective. I don't think a human player could have done it much better. In semi-comical fashion, I had another unescorted settler heading over to the English island at the time that Victoria declared war, and that unit just barely managed to land to the south of New Orleans on this turn. A single turn slower and that unit would have been captured by those English galleys patrolling the waters between our islands. I decided that I might as well head further inland and try to set up another city, hoping that the AI would fail to notice it and attack. This did in fact work out, and my new city of Baltimore (planted to the south of that mountain peak in the corner of the screenshot) would never be threatened. Instead, Victoria would sail her units over to my homeland to cause further trouble. By this point, I'd had enough time to be ready for them though, swapping into Agoge policy and cranking out a group of archers from my core cities. Archers and all of the ranged units are just so good in Civ6 (the balance would be better if they were all nerfed in combat strength), and with four archers on hand, I had no trouble shooting down the bulk of Vicky's forces. They were only warriors and chariots, after all. I intended to continue the war until I could recapture New Orleans, but surprisingly Victoria was willing to return the city to me in a peace treaty if I would kick in 11 gold/turn. That was a trivial sum to pay, and I happily sued for peace. (Note on the offchance that anyone from Firaxis ever reads this: the AI should not be willing to give back captured cities this easily.) Time to get back to my peaceful builder's game. Here's the standard overview from Turn 100. 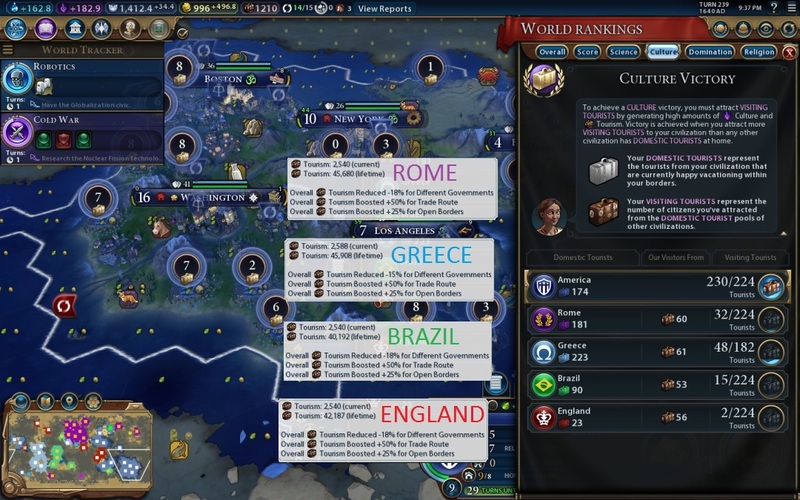 I've played enough Civ6 by now to know that the beaker and culture outputs in the screenshot above are decent, if far from spectacular, for this date on the calendar. 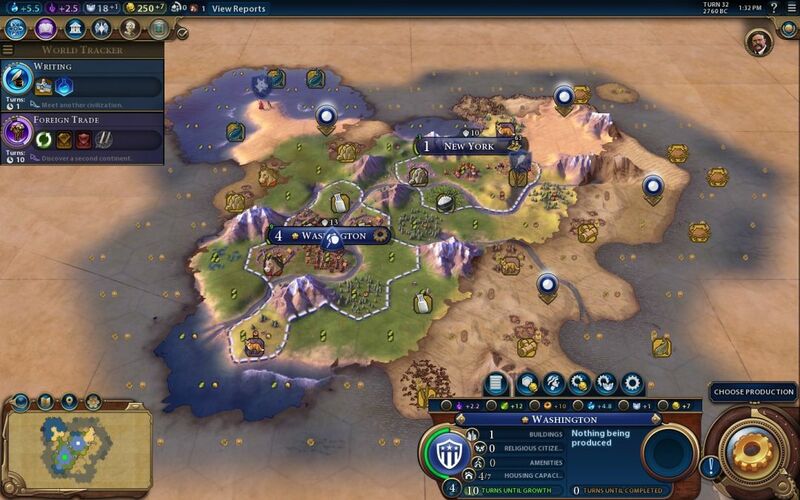 The main way to accelerate your growth curve in Civ6 is to attack the AI and capture their settlers/cities, which was something that I had no desire to do in this game. A peaceful builder's game, that's what this was. The tightly constrained land at my start also didn't make matters any easier, and under the circumstances I was pretty happy with how everything was going. The war with Victoria had been my only real hiccup thus far. Domestically, Washington had Campus and Commercial districts completed, and I was beginning an Entertainment district for the purpose of building the Colosseum. I was building Commercial districts first in all my other cities, as they still seem to outperform everything else. 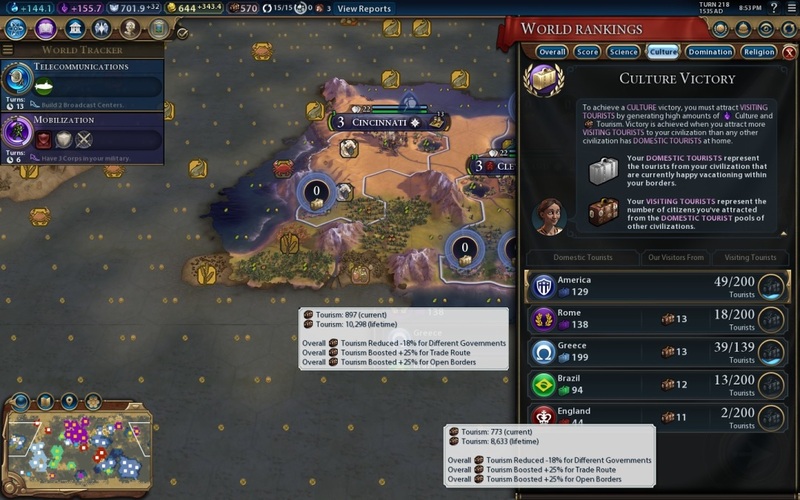 The trade routes are extremely useful at speeding up the growth curve of new cities, and more gold is always good for pursuing any victory condition. I've been scaling back Industrial districts since the big nerf to factories in the second patch, and trying out some of the other districts as a second build choice. I still don't know if this works better, but I'm having fun experimenting. By this point, I had managed to contact all of the other AI leaders in the game: Trajan, Pedro, and Pericles in addition to Victoria. Rome was located further to the northwest beyond England, while Brazil and Greece were directly west (or directly east) about halfway around the world from me. I was discovering that much of the northern hemisphere was unoccupied, and I hoped to be able to claim a good portion of it for myself. There was nothing but ocean to my east, and that meant expansion was going to have to head further west for the moment until I could research additional technology. Now here's what I'm talking about. After thirty-something turns of peaceful building, I had swapped into the Colonization policy and churned out a new series of settlers. Thanks to diligent exploration with scouts and galleys, I knew that this large continent to the north was mostly empty. Quite aside from more places to build seaside resorts, this landmass also contained a series of new luxury resources: cocoa, ivory, and incense. My starting island had exactly one luxury (furs), and that was part of the reason why I had emphasized the Colosseum, as I would have run out of happiness pretty quickly without it. With the wonder successfully completed, it was time for further expansion. I placed my first settler at the river mouth west of the cocoa resource, and the second one in that double river valley further west by the other cocoa. More cities would later follow further to the north. 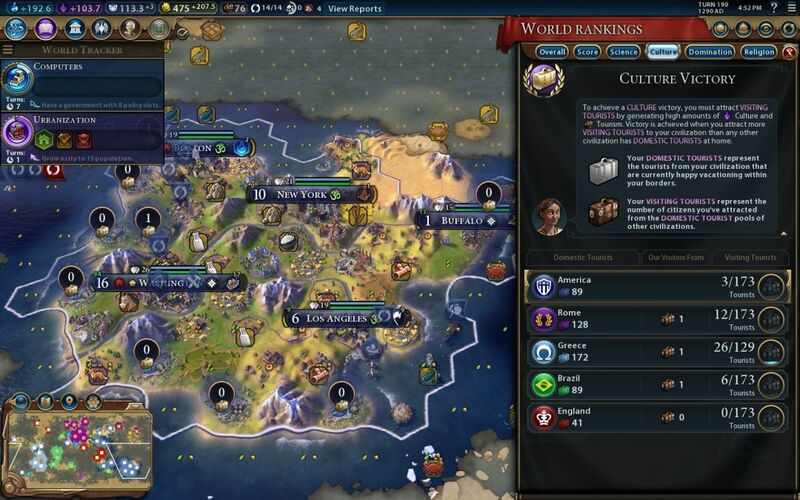 With plenty of hills for production and domestic trade routes to boost their food/production, these cities were able to get up and running very quickly. One other thing worth noting: the AI's settlement patterns in this game were ten kinds of crazy. Trajan did a nice job of filling out his initial starting area with a solid core of cities... and then he skipped this whole area to plant Antium in the far northeast. Similarly, Victoria ignored settling the fertile southern part of her island to plant two cities off to the west, and one of them extremely far to the west, beyond Brazil's territory. She would eventually wind up with three cities over there in the extreme northwest corner of the minimap. Seriously, what were these AI leaders thinking?! At least I had no problems with any of them after the early game scrape with Victoria. I maintained friendships with Brazil and Rome for most of the game, and Trajan in particular loved me. That was a good thing because my colonies up on Rome's continent were almost completely undefended, heh. 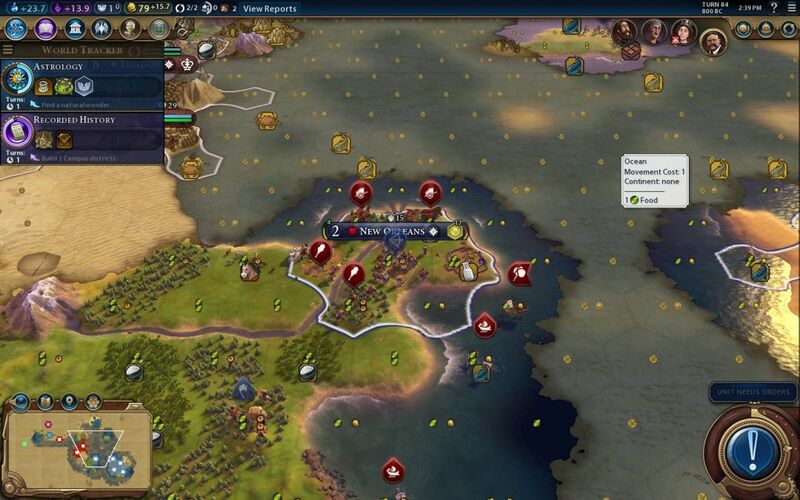 Then there was this city from Brazil, crammed into a spot near Baltimore and New Orleans, and not even controlling all of its first-ring tiles. I was content to let Pedro have this tiny little spot, as all of the tiles were hills and couldn't be used for seaside resorts later on. Very odd choice nonetheless; surely there was somewhere else on the map that made for a better location than this, right? Anyway, I had picked up Cartography tech at an early date, and by this point had defogged much of the world with a combination of my old pair of galleys and a series of scouts. 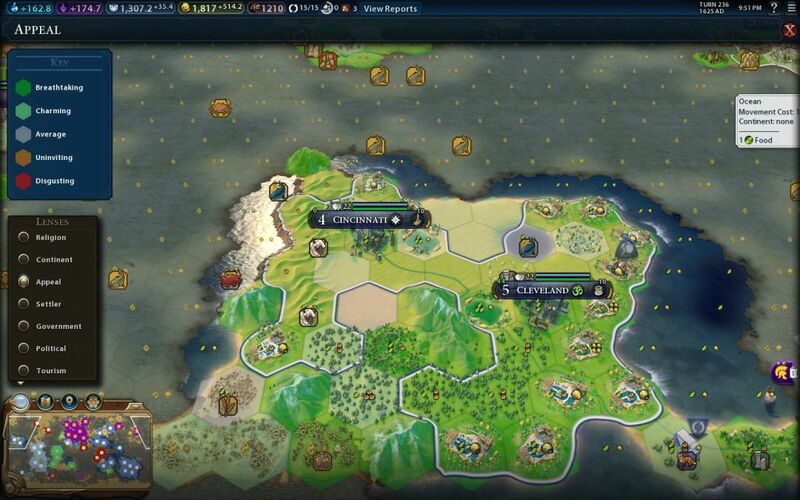 Those scouts are excellent units for exploring the oceans, as I had found out earlier in my CivFanatics GOTM 06 effort. I was in a Merchant Republic government by this point (as usual), using a fairly standard series of policies: Conscription in the military slot, Charismatic Leader in the diplomacy slot, and then a whole bunch of economic policies. Meritocracy and National Philosophy/Rationalism I kept in place permanently to boost culture and science respectively, then I used some combination of Caravansaries (gold), Medina Quarter (housing), Serfdom (builders), and Colonization (settlers) depending on what I was constructing at the time. These seem to be the key economic policies that I keep coming back to in game after game, and this island endeavor was no different. I had accumulated precisely zero tourism to this point in time. There was an insignificant amount of wonder tourism from the Colosseum, and that was it. With my variant rule banning Great Works and artifacts, there was no rush to accumulate Great Person points or get archaeological museums up and running. Greece was instead the tourism leader for the moment, reaching the 100 culture/turn mark and claiming enough of the early Great Works to get about 20% of the way to the cultural victory. I wasn't worried about losing the game, since the cultural victory condition is much too (needlessly) complex for the AI to understand what to do, and once my seaside resorts were up and running, I would be able to pile up foreign tourists in a hurry. It was just a matter of reaching the key techs I needed on the tree and builder the associated wonders for resort tourism. By Turn 180, Radio tech was finally about to complete. I had been beelining there pretty hard, with the bottom half of the tech tree almost completely unresearched at this point in time. I was also quite pleased at being able to wring 170 beakers/turn out of this island setup without going to war and conquering anything from the AI civs. The logistics of this map were a lot harder than having a normal continent full of land tiles. As I mentioned above, Civ6 is not like Civ3/Civ4 where fishing villages can be useful contributers. All non-resource water tiles are awful, and as a result maps with few land tiles play a lot slower. America still had zero foreign tourists at this point in time, but that was about to change in a hurry. When Radio tech finished two turns later, I could begin constructing the seaside resorts, so let's look at this mechanic in a bit more detail. Seaside resorts are a tile improvement that produce gold equal to the appeal of the underlying tile. In this zoomed-in screenshot above, the seaside resort next to Boston has an appeal of 6, and as a result the tile improvement has a yield of 6 gold. Because the base tile underneath was desert, it produces no food or production. Seaside resorts also produce double the tile's appeal in tourism, and this is the main reason why anyone would want to build them. A city does not have to work the tile itself to get the tourism benefit. This is one place where having the tile yields turned on is super helpful: the gold output of a resort is the tile's appeal, and double that is the resort's base tourism value. 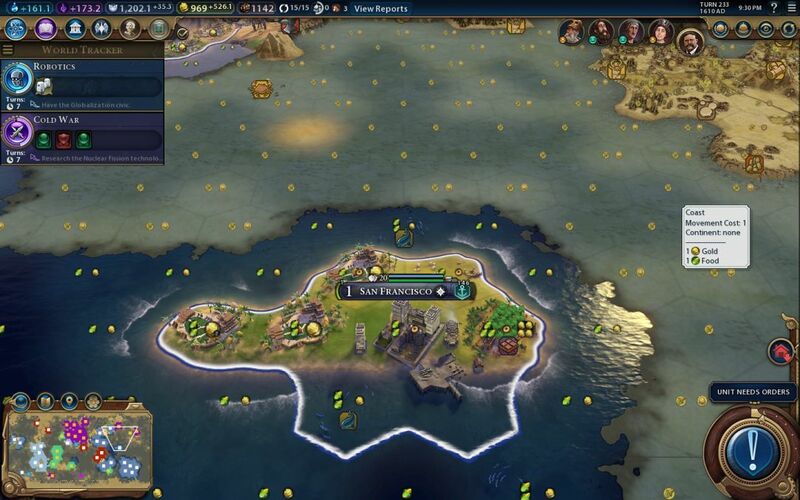 This particular tile is worth 12 tourism/turn for example. Unfortunately the game's interface does a terrible job of making any of this clear, and it's not helped by the fact that the tourism icon at the top of the screen does not update in real time, only between turns. As a result, it's very hard to know what benefit the resorts are providing without digging deep into the mechanics behind them. This is another area where the user interface or tooltip help needs to be better. There's no excuse for the lack of feedback on what's happening here. There are a ton of restrictions associated with the placement of seaside resorts. For starters, they must be located on grassland, plains, or desert tiles. I guess it makes sense that tundra and ice tiles aren't allowed, since they are resort destinations and all, but this is poorly explained while playing the game. Seaside resorts also can only be located on flatground tiles, not hills, and I find that to be one of the more obnoxious restrictions. Apparently the guests only want to visit flat beaches in this universe. The resorts also must be located next to the coast, and finally, they can only be constructed on tiles with "Breathtaking" appeal or higher (4 or more). The appeal restriction is the toughest one to work around, and deserves the most explanation. +2: Each adjacent natural wonder. +1: Each adjacent Holy Site district, Theatre district, Entertainment district, or wonder. +1: Each adjacent mountain, forest, coast, or oasis tile. +1: If the tile is on a river or a lake. -1: Each adjacent Industrial district, Encampment district, Aerodrome district, or Spaceport. -1: Each adjacent rainforest, marsh, or floodplains tile. 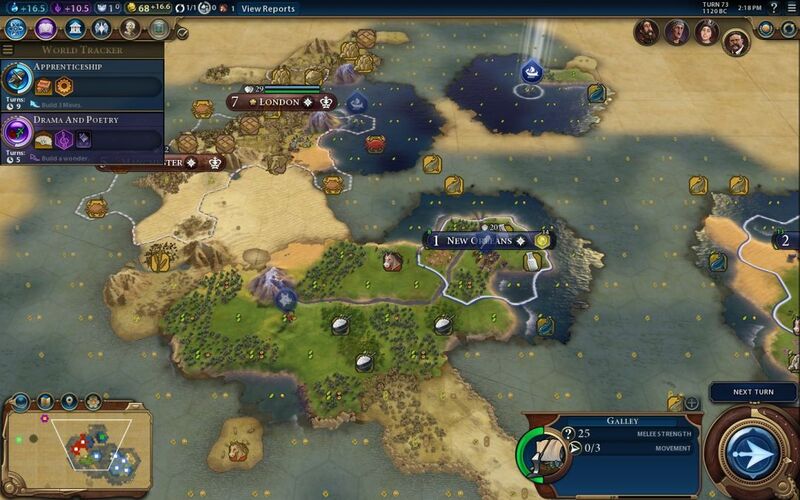 In the screenshot above, this desert tile is bordering five coastal tiles and an Entertainment district, which results in the tile appeal of six. That's the highest value that a tile can reach under normal circumstances (i.e. not bordering natural wonders), and in practice it can be tricky to reach the 4 appeal needed to construct a resort. The biggest tool available is the Eiffel Tower wonder, which adds +2 appeal to all tiles and typically opens up lots of tiles for resorts that otherwise would be unavailable. The other useful option is the ability to plant forests, which builders can accomplish after researching the Conservation civic. Through the addition of more forest tiles, a crafty player can open up locations for more resorts that would otherwise be impossible. Finally, the player can also build Holy Site, Theatre, and Entertainment districts to increase the appeal of neighboring tiles. That's tough to do, but since forests can't be planted on desert tiles, there are some places where it's the best option. I planned to use all of these tools for resort-building in this game. Here's the home island with the initial resorts completed. There are eight of them in total, and the collection has increased my overall base tourism by about 70 points. Your first impression might be something along the lines of, "so what, that's not very impressive!" And indeed, taken in the abstract the resorts don't seem that useful. I think Firaxis intended them to be a minor addition to the tourism game, with most of the benefit coming from Great Works and artifacts. However, there are three separate targets with multiplicative effects on seaside resorts, which combine together to make the resorts extremely powerful. The first of these is Computers tech, which doubles all sources of tourism and is always one of the cornerstones of any cultural gameplan. The fact that the tech is located very close to Radio on the top side of the tech tree makes the pair of them easy to beeline together, and indeed I was already heading in that direction. Add in Computers tech and suddenly resorts are producing four times the tile's appeal in tourism. That makes them a lot more viable, with a base value of 4 * 2 * 2 = 16 tourism. But we're just warming up here. The other resort multipliers come in the form of a pair of wonders. I mentioned the Eiffel Tower previously, which adds +2 appeal on all tiles. That opens up more tiles for resorts and adds significant tourism to all of the existing results, a bare minimum of 2 * 2 * 2 = +8 tourism to every resort that's already been constructed. The other wonder is Cristo Redentor, which has the simple effect of doubling all tourism from seaside resorts. 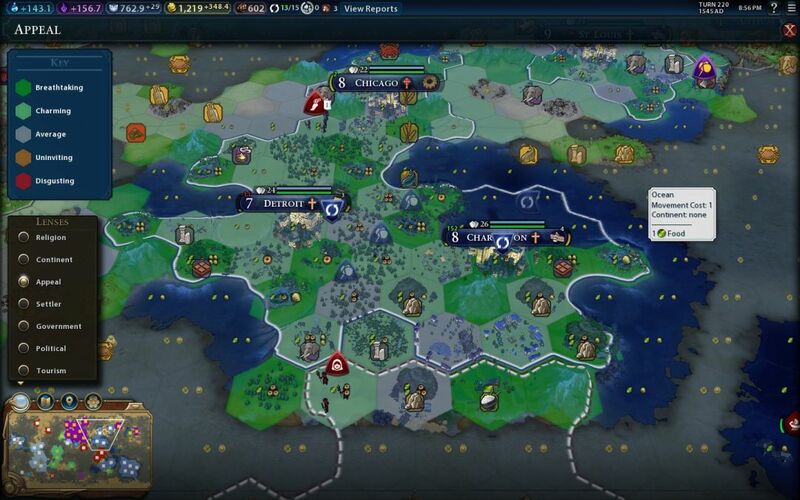 For a tile with a starting appeal of 4, the Computers/Eiffel/Cristo combo is therefore worth (4 + 2) * 2 * 2 * 2 = 48 tourism/turn. For EACH resort! That's more than a fully themed museum, and there's no limit to the number of resorts that can be planted on the map. If the player can land both of those key wonders, the resort tourism balloons in a real hurry. In another real-life parallel, the seaside resorts were expensive to construct. They require a lot of builder labor to set up, since the land typically has to be cleared first before the resort itself can be constructed. I found myself removing farms in a lot of locations, or chopping forests, draining marshes, that kind of thing. Resorts also can't be built on top of resources, which necessitates clearing stone or harvesting wheat before the resort can be finished. I ended up cash-rushing a lot of builders, even though I had made a conscious attempt to train some ahead of time to be ready when Radio tech finished. Then there was also the need to purchase dozens of tiles to plant the resorts; you can't exactly sit around waiting for those recent colonies to take 150 turns to expand their borders out into the third ring. I should have switched into the policy that discounts tile purchases, as I spent thousands and thousands of gold on tile purchases in this game. Ah well, room for improvement in the next game. New York was the only realistic place to put the wonder, as it had already constructed Ruhr Valley earlier. I used a Great Engineer (Isidore of Miletus) that I had been saving forever to knock out some of the cost of Cristo, and I would be able to recruit Gustave Eiffel to help me with the Eiffel Tower (ha!) in New York immediately following this first wonder. Even with both Great Engineers kicking in additional free production, it still took a long time to build these wonders, longer than I would have liked. There just weren't a lot of land tiles on this map, and that slowed down production considerably compared to a normal game. With faster wonder build times, I could have won this game substantially sooner. As it was, I finished Cristo Redentor on Turn 215, and Eiffel Tower on Turn 223. What's going on here - why was tourism to Rome higher than tourism to England? The modifiers were clearly identical in both cases, and I had never seen anything like this before. It couldn't be caused by religious tourism, as I had no self-founded religions or relics, not to mention I had built Cristo Redentor. What gives? Eventually I was able to figure out the culprit, and it came in the form of America's unique building, the Film Studio. 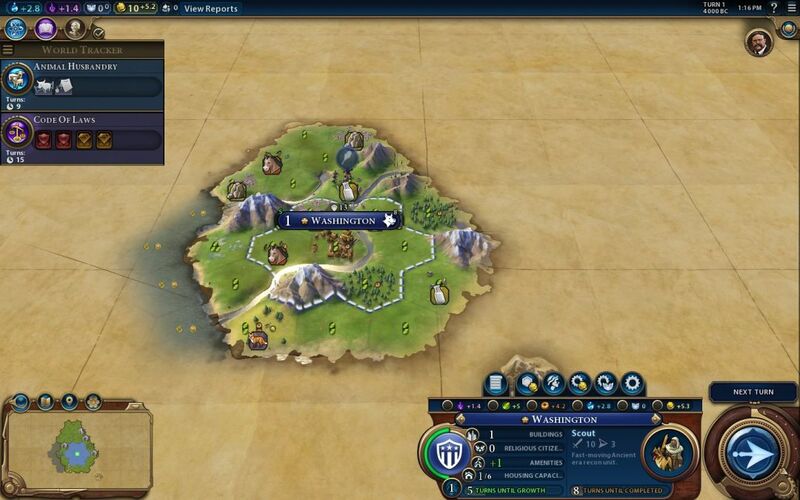 As I mentioned at the beginning of this report, the Film Studio has a +100% modifier for tourism produced in the city where it is built, a unique mechanic not found anywhere else in Civ6. However, reading the description for the building more closely revealed that this benefit only applies to other civs which have reached the Modern era or later. Rome was also in the Modern period, while England was still stuck back in the Industrial era. Apparently they were too backwards to watch films about the amazing tourist resorts going up across America, or something like that. As usual, there was a logical explanation behind these numbers, but the interface did a terrible job of explaining what was actually happening. Let's look at a concrete example of how tile appeal works in action. Take the resort tile halfway between Charleston and Detroit, where the northernmost builder is standing in that screenshot. That tile had bordered the ocean to the east, which resulted in a natural appeal of 1 for the tile. Normally a tile like this would never qualify for a seaside resort. However, my environmentally-friendly builder taskforce has planted trees on the inland tiles west and southwest of this location, bumping up the tile appeal to 3. I would normally try to construct a resort on the tile to the northwest, but that's a hill tile, and so my builders added a forest there as well, taking the appeal of the tile to 4 and opening it up for a seaside resort. The tile to the northeast is also a hill (currently with a mine), and therefore I could bulldoze that mine and replace it with a forest + lumbermill combo if I wanted, trading -2 production for +1 appeal and therefore +8 tourism after running through the various multipliers. 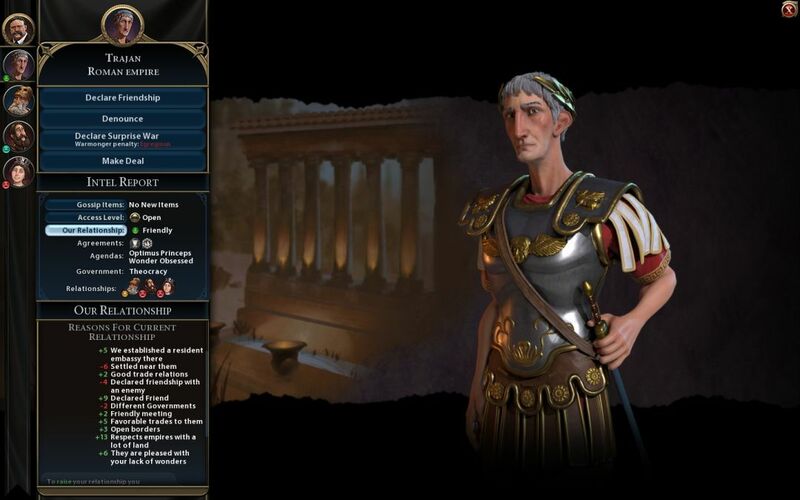 Of course, that would also require investing more builder actions to make it happen, and there is the production tradeoff to think about... Stuff like this is why I keep coming back to Civ6. There are a lot of competing priorities to juggle, and the economic side of the game legitimately works well. Cincinnati and Cleveland: truly a resort paradise! They really were in this game though. There were three resorts at Cincinnati, and a stunning ten resorts in total at Cleveland. I had identified much earlier in the game that the Cleveland site would eventually become a fantastic location for resorts, and this city delivered in a big way. In addition to building all those resorts, I blanketed the southern part of the land in forests to boost tile appeal. 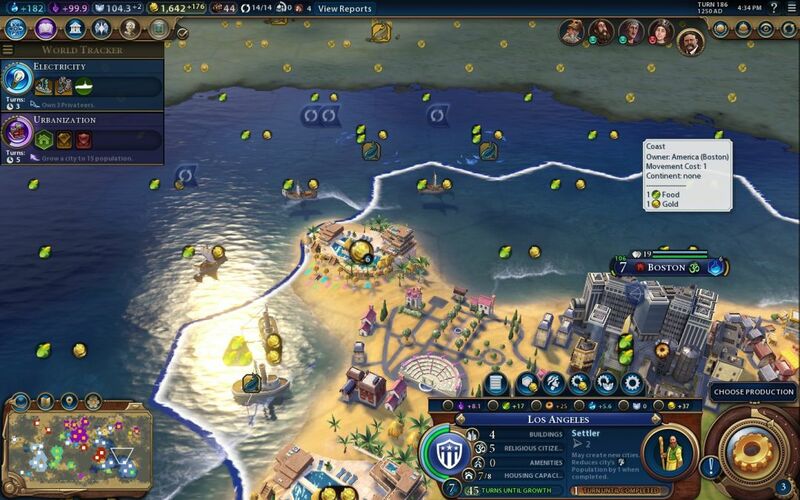 It's worth doing that even if Eiffel Tower allows a resort to go on the tile anyway, since as I mentioned above every +1 appeal = +8 tourism if you have the Computers/Cristo combination. Note as well the Entertainment district northeast of Cleveland, and the Holy Site district hidden northwest of Cincinnati. They were both constructed solely to boost tile appeal and open up more resorts. I wish that I could have build another appeal-boosting district (Entertainment, Theatre, or Holy Site) between the two lakes north of Cleveland, as that would have increased the appeal of those northern desert tiles enough to add resorts there as well. But these cities had very low production, and I'd already bulldozed all the old growth forests. Maybe I should have mined the desert hills at Cincinnati; perhaps that would have worked. Worth thinking about for the future - mines do not lower tile appeal. Total tourism from these 13 resorts: 71 * 8 = 568 base tourism/turn!!! Wow. Almost half of the total for my entire civilization. This truly was a resort paradise! I identified this place early on as a location to build seaside resorts at a later date. It wasn't worth settling until I had Eiffel Tower though, as the western peninsula tile was the only one that could build a seaside resort beforehand. So I delayed going for this location in favor of better spots, and when I finally established San Francisco, it was able to get its resorts done almost immediately. Even this tiny island could hold three resorts worth a total of 136 tourism/turn; if it weren't for the stupid buried artifact northeast of the city and the unremovable cocoa resource, I could have resorts on those tiles as well for another 77 tourism/turn. Grabbing city spots like this was a lot of fun regardless. San Francisco felt like a genuine resort town, the Caribbean resort destination for the people in my homeland. It was even located in the tropics on the map! Fishing, sunbathing, chocolate: looked like a fun place to go. 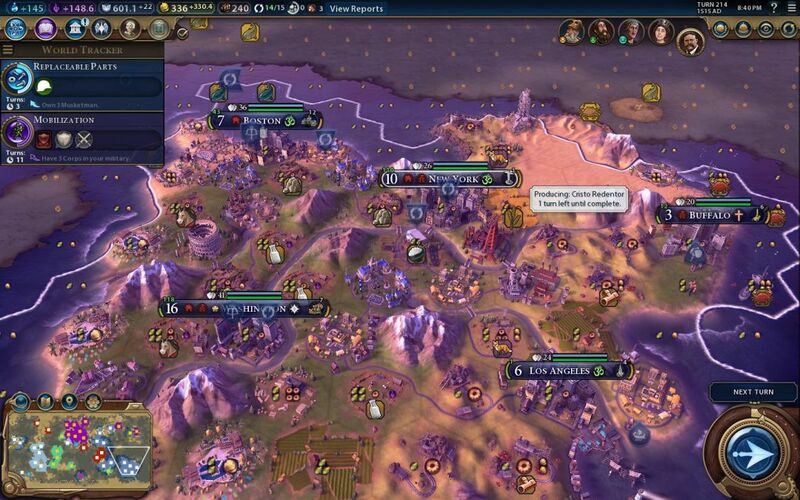 Cultural victory on Turn 239, exactly one turn later than my finishing date in CivFanatics GOTM 06. The base tourism at the top of the screen ticked over 1200/turn, and the real per-turn tourism after being fed through modifiers was just over 10,000. 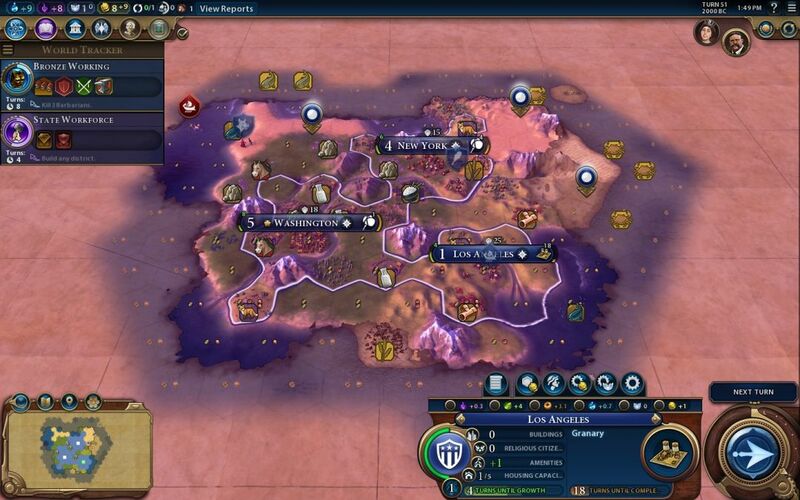 On a map with only five total civs, each foreign tourist required the accumulation of 750 tourism, which meant that I was pulling in about 13.5 foreign tourists per turn - more than three foreign tourists with EACH of the other nations per turn! The number needed to win was actually dropping every turn, as I was stealing significantly more domestic tourists away from Greece than their own civ was producing. (On the previous turn, I stood at 217/226 tourists, then won this turn with 230/224.) Long story short: the people on this particular planet truly loved visiting those American resorts. As I was expecting, my tourism went from zero to dominant in the span of 50 turns. Even that is underselling things a bit, as the biggest bottleneck was lacking enough research to hit the key techs sooner, and enough production to build the key wonders in a faster timeframe. 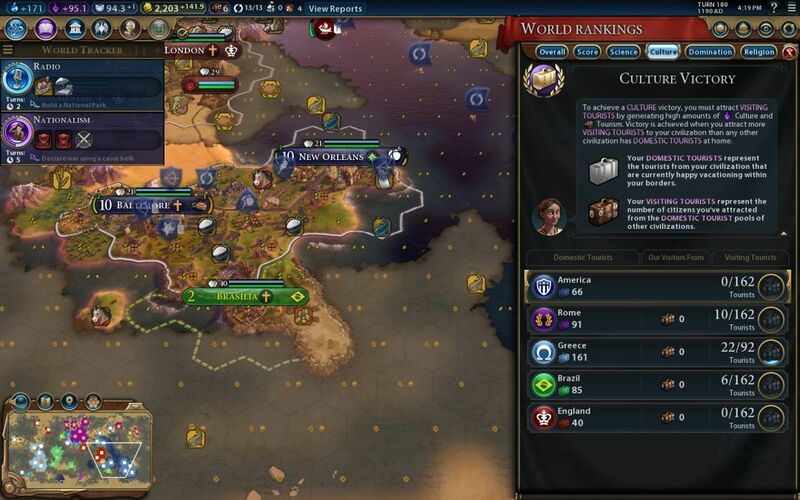 After I completed the Computers/Cristo/Eiffel trifecta, it only took 15 more turns to generate 160 foreign tourists, and that pace was still accelerating. 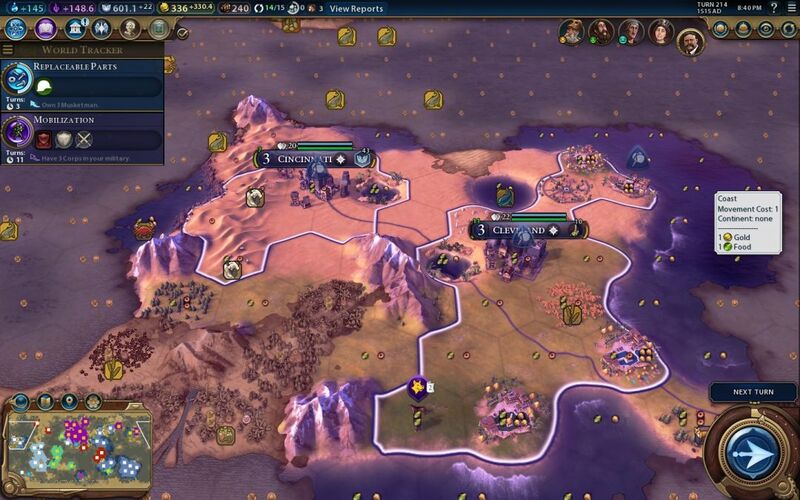 It turns out that if the player has enough resort-capable terrain available, there's little need for culture at all to win the cultural victory type. 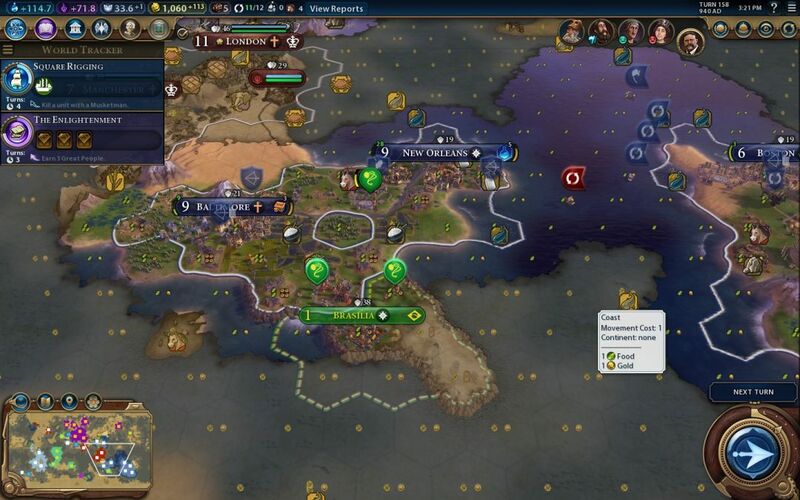 The ending date is determined by a combination of three factors: having enough builders and tiles available to construct the resorts, reaching Radio/Computers/Steel techs, and constructing the Cristo Redentor and Eiffel Tower wonders. The only place where culture is needed is reaching Mass Media civic for the purposes of building Cristo. It's kind of weird that the resorts can so completely overshadow the Great Works, but as T-Hawk has said on numerous occasions, play the game as it is, not as the designers envisioned. They apparently were still thinking in Civ5 terms of little four-city empires, and significantly underestimated how much tourism the resorts can put out. I had just over 30 resorts in this game, and a bigger map could have significantly more than this. I had a lot of fun with this game, and it did a nice job of showcasing the power of the seaside resorts. They are much, much stronger than I thought in my initial Cultural games. Kudos to the Game of the Month players for demonstrating this to me. As always, thanks for reading and watching.